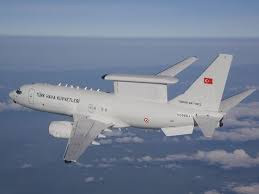 ANKARA — Feeling increasingly threatened by regional tensions, Turkey’s military and procurement authorities are mulling to exercise a follow-on order option in their airborne early warning and control (AEW&C) contract. If the government decides to go ahead with that option, it will order two more AEW&C aircraft from Boeing under the country’s Peace Eagle program. “We are faced with a different threat concept than the concept we assessed when we ordered four [AEW&C] aircraft. New [threat] deliberations may force us into a new acquisition,” a senior procurement official said. A security official said that a follow-on order may be discussed and endorsed by the Defense Industry Executive Committee later this year. If such a decision is made, the purchase order will be added to the next 10-year procurement plan now being drafted. “There are indications that the end user [the Turkish Air Force] may have to revise its operational requirements in line with a better coverage of Turkish airspace for early warning missions,” the official said. In December, Boeing delivered the fourth and last Peace Eagle airborne AEW&C aircraft to the Turkish armed forces, which the company said would further increase the country’s self-defense capabilities. The final aircraft came with upgraded software and a software support center to augment the ground support unit. In addition to the four aircraft, the Peace Eagle program includes ground support segments for mission crew training, mission support and system maintenance. Turkey is the only country in its region to have AEW&C capabilities. AEW&C provides advanced airborne surveillance and battle management capabilities, and can simultaneously track airborne and maritime targets. Under a July 23, 2003, contract priced at more than $1.6 billion, Boeing was to develop and deliver four AEW&C aircraft to the Turkish Air Force in 2008. The program involved the delivery of the 737-700 airframe, ground radar and control systems, ground control segments for mission crew training, mission support, and maintenance support. Ankara said in 2013 that it would impose sanctions on Boeing “for major delays” in the spy plane program, a top Turkish official said. Turkish Defense Minister Ismet Yilmaz said in April 2013 that program delays were due to the company’s failure to develop the system as well as other uncontrolled events within the program. Some Turkish procurement officials say that the delays and snags in the Peace Eagle program left a “bitter after taste” in Ankara. Yet they say the program had a happy ending and operational requirements would always come before past hurdles. “There were minor to major disputes throughout the contract. But what matters for the Air Force is which capabilities it thinks it must possess for better surveillance capabilities,” another procurement official said. A local industry source said local companies involved in the Peace Eagle program would welcome a follow-on order. “Turkish companies earned valuable know-how and technological capabilities from the AEW&C program — and work share. They would be keen to be part of a new contract,” a senior aerospace industry source said. Turkish companies that worked as subcontractors of the program include Havelsan, Tusas Turkish Aerospace Industries, software specialist Mikes, military electronics specialist Aselsan and Turkey’s national carrier, Turkish Airlines. The 737-700 aircraft are to be used as part of Turkey’s NATO capabilities. An airborne early warning and control system is an airborne radar system designed to detect aircraft, ships and vehicles at long ranges, and to control and command the battle space in an air engagement by directing fighter and attack aircraft strikes. Used at a high altitude, the radars on the aircraft allow the operators to distinguish between friendly and hostile aircraft hundreds of miles away.